Digicel and the PNG Women in Business (WiB) are pleased to announce that the second Digicel Women in Business Expo will run from 15th–25thofSeptember at the Steamships Compound in Waigani, Port Moresby. The PNG WiB is the peak body advocating for economic empowerment for women to help build business and community leaders. The expo is aimed at showcasing goods and services and entrepreneurship among women. There will be fun-filled activities, arts and crafts, and displays of professional services produced by PNG women. Digicel is once again the event’s major sponsor, today announcing a generous contribution of K100,000 in front of a crowd of people including female entrepreneurs, members of professional women’s business associations, members of WiB and the media.This support comprises K50,000 in cash and K50,000 in-kind. The SMS blasts will be sent to Port Moresby residents between Tuesday, 13 September and Sunday 25 September, to inform them of important details around the expo including dates, opening and closing times and range of activities during the expo. Digicel’s Retail Director, Lorna McPherson said the WiB Expo is one of the key business events held each year in PNG. “The Digicel Women in Business Expo is an incredibly important event to help empower women in PNG and Digicel is proud to return as a major sponsor for another year,” he said. “Digicel is committed to improving the PNG economy by supporting grassroots programs and minority groups, and it is organisations such as WiB that are making a difference for women across the country. “Janet Sape works tirelessly to empower women to achieve their own economic independence and deserves to be commended for these efforts. Janet Sape said the Digicel Women in Expo would showcase PNG Women’s products and services as well as provide an avenue to recognise the importance of exposing our women-run businesses to the public.She encouraged all NCD residences to support the event and the greater cause of women empowerment in PNG. Mrs Sape also invited civil societies, private sector organisations and others supporting women’s empowerment in PNG to participate and showcase their services to the public. 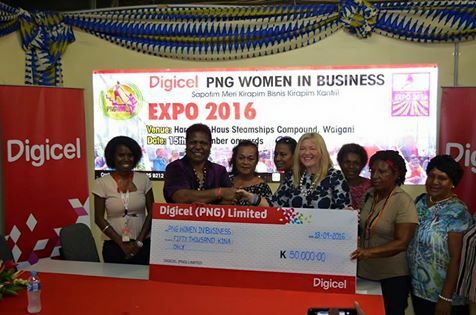 The Digicel Women in Business Expo will be the third such event after PNG WiB’s successful inaugural Expo in Lae in 2010. Background: PNG Women in Business is the peak body advocating for economic empowerment for women to help build business and community leaders. Mrs Janet Sape is the Founding Director of the Papua New Guinea Women in Business (PNG WiB).